This article is about the condiment. For the music native to Trinidad and Tobago, see Chutney music. Seasonings such as salt, spices/herbs, and vegetables/fruits such as chilis, Damsons, plums, tomatoes, apple, pear, onion, garlic, fig, etc. 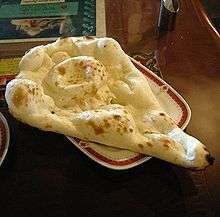 The nearest bowl to the viewer is a dahi chutney, based on yogurt (dahi). 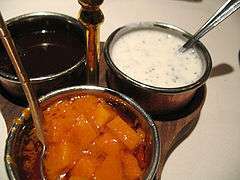 Chutney (Devanagari- "चटनी" also transliterated chatney or chatni, Sindhi: چٽڻي‎) is a sauce in the cuisines of the Indian subcontinent that can vary from a tomato relish to a ground peanut garnish or a yoghurt, cucumber and mint dip. An offshoot that took root in Anglo-Indian cuisine is usually a tart fruit such as sharp apples, rhubarb or damson pickle made milder by an equal weight of sugar (usually demerara or brown sugar to replace jaggery in some Indian sweet chutneys) Vinegar was added to the recipe for English-style chutney that traditionally aims to give a long shelf life so that fall fruit can be preserved for use throughout the year (as are jams, jellies and pickles) or else to be sold as a commercial product. Indian pickles use mustard oil as a pickling agent, but Anglo-Indian style chutney uses malt or cider vinegar which produces a milder product that in western cuisine is usually eaten with a Cheddar-type cheese or with cold meats and fowl, typically in cold pub lunches. 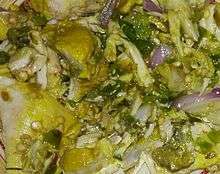 Nowadays, some of the making of pickles and chutneys that at one time in India was done entirely in people's homes has passed over into commercial production. The disadvantage of commercial chutneys and those produced in western style with vinegar and large amounts of sugar is that the main aim of sugar and vinegar as preservatives is to make the product safe for long-term consumption. Regular consumption of these products (as distinct from the original Indian array of fresh relishes) can add to total sugar consumption being increased to unhealthy levels. In India, chutneys can be either made alongside pickles that are matured in the sun for up to two weeks and kept up to a year or, more commonly, are freshly made from fresh ingredients that can be kept a couple of days or a week in the refrigerator. In south India, Thogayal or Thuvayal (Tamil) are preparations similar to chutney but with a pasty consistency. Medicinal plants that are believed to have a beneficial effect are sometimes made into chutneys, for example Pirandai Thuvayal or ridged gourd chutney (Peerkangai Thuvayal). Ridged gourd can be bought in Chinese and Indian shops in large towns in the west. and, when dried, becomes a bath sponge known as a luffa or loofah. Bitter gourd can also serve as a base for a chutney which is like a relish or, alternatively as a dried powder. Occasionally, chutneys that contrast in taste and colour can be served together — a favourite combination being a green mint and chile chutney with a contrasting sweet brown tamarind and date chutney. 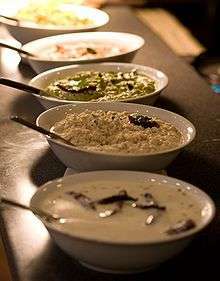 Chutneys may be ground with a mortar and pestle or an ammikkal (Tamil). Spices are added and ground, usually in a particular order; the wet paste thus made is sautéed in vegetable oil, usually gingelly (sesame) or peanut oil. Electric blenders or food processors can be used as labor-saving alternatives to stone grinding. American and European-style chutneys are usually fruit, vinegar, and sugar cooked down to a reduction, with added flavourings. These may include sugar, salt, garlic, tamarind, onion or ginger. Western-style chutneys originated from Anglo-Indians at the time of the British Raj recreated Indian chutneys using English orchard fruits — sour cooking apples and rhubarb, for example. They would often contain dried fruit: raisins, currants and sultanas. They were a way to use a glut of fall fruit and preserving techniques were similar to sweet fruit preserves using approximately an equal weight of fruit and sugar, the vinegar and sugar acting as preservatives. South Indian chutney powders are made from roasted dried lentils to be sprinkled on idlis and dosas. Peanut chutneys can be made wet or as a dry powder. Spices commonly used in chutneys include fenugreek, coriander, cumin and asafoetida (hing). Other prominent ingredients and combinations include cilantro, capsicum, mint (coriander and mint chutneys are often called हरा hara chutney, Hindi for "green"), Tamarind or Imli (often called meethi chutney, as मिठाई meethi in Hindi means "sweet"), sooth (or saunth, made with dates and ginger), coconut, onion, prune, tomato, red chili, green chili, mango lime (made from whole, unripe limes), garlic, coconut, peanut, dahi, green tomato, dhaniya pudina (cilantro and mint), peanut (shengdana chutney in Marathi), ginger, yogurt, red chili powder, tomato onion chutney, cilantro mint coconut chutney and apricot. Major Grey's Chutney is a type of sweet and spicy chutney popular in the United Kingdom and the United States. The recipe was reportedly created by a 19th-century British Army officer of the same name (likely apocryphal) who presumably lived in Colonial India. Its characteristic ingredients are mango, raisins, vinegar, lime juice, onion, tamarind extract, sweetening and spices. 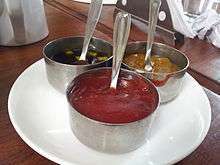 Several companies produce a Major Grey's Chutney, in India, the UK and the US. The word "chutney" is derived from the Hindi word चटनी chaṭnī, meaning to lick. It is written differently in North and South Indian languages (Nepali: चटनी, Gujarati: ચટણી, Bengali: চাটনি chatni, Sylheti: ছাতনি satni, Marathi: चटणी, Punjabi: ਚਟਣੀ, Tamil: சட்டினி chaṭṭiṉi, காரத் துவையல் karathuvaiyal, Kannada: ಚಟ್ನಿ, Hindi: चटनी, Urdu: چٹنی‎, Sindhi: چٽڻي‎, Malayalam: ചട്ടിണി, chattin̩i, ചമ്മന്തി, Telugu: పచ్చడి). 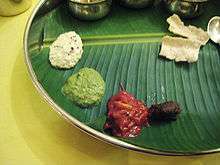 Pacchadi, as written in Telugu script, refers specifically to pickled fruits, whilst chutney refers to minced foods, usually made out of coconuts. In India, "chutney" refers to fresh and pickled preparations indiscriminately. Several Indian languages use the word for fresh preparations only. A different word achār (Hindi: अचार) applies to pickles that often contain oil and are rarely sweet. Similar in preparation and usage to a pickle, simple spiced chutneys can be dated to 500 BC. 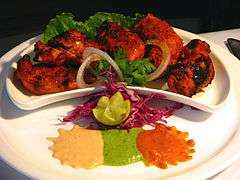 Originating in India, this method of preserving food was subsequently adopted by the Romans and later British empires, who then started exporting this to the colonies, Australia and North America. As greater imports of foreign and varied foods increased into northern Europe, chutney fell out of favor. This combined with a greater ability to refrigerate fresh foods and an increasing amount of glasshouses meant chutney and pickle were relegated to military and colonial use. Chutney reappeared in India around the 1780s as a popular appetizer. Diego Álvarez Chanca brought back chili peppers from the Americas to Spain in 1493. He had sailed with Columbus. After discovering their medicinal properties, Chanca developed a chutney to administer them. Major Grey's Chutney is thought to have been developed by a British officer who had traveled to India. The formula was eventually sold to Crosse and Blackwell, a major British food manufacturer, probably in the early 1800s. In the 19th century, types of chutney like Major Grey's or Bengal Club created for Western tastes were shipped to Europe from Monya. The tradition of chutney making spread through the English-speaking world, especially in the Caribbean and American South, where chutney is a popular condiment for ham, pork, and fish. Telangana: coconut, peanut, tomato, lemon, curry leaf, tamarind, green chilli, ginger, mint, mango chutneys. 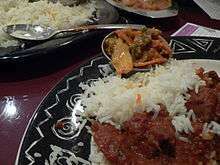 ↑ Jellies, Jams & Chutneys, Prince, Thane. Jellies, Jams & Chutneys. Penguin. ↑ "Tomato Onion chutney « Sinful Curry". sinfulcurry.com. ↑ "Cilantro Mint Coconut Chutney « Sinful Curry". sinfulcurry.com. ↑ Sara Buenfeld (1 February 2008). "Apricot blatjang". BBC Good Food. Weaver, William Woys. "Chutney". Encyclopedia of Food and Culture. Ed. Solomon H. Katz. Vol. 1. New York: Charles Scribner's Sons, 2003. 417–418. 3 vols. ISBN 0-684-80568-5. Dahiya, Ashish. Food of Haryana: The Great Chutneys Vol. 1. India. ISBN 978-93-81818-05-3.